Mock Objects: Chapter 1. What's the point of Test-Driven Development? Chapter 1. What's the point of Test-Driven Development? 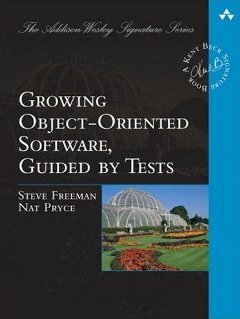 We are now publishing chapters of our book, Growing Object-Oriented Software Guided by Tests in a separate section of the site. We will publish news about new content in the blog but will not include the entire contents of each chapter as blog posts. We have updated Chapter 1, What's the Point of Test-Driven Development? in response to feedback from blog comments and the discussion group and improved some of the diagrams. More comments are always welcome. What kind of feedback are you and Nat looking for? Personally I think the model used for The Art of Agile Development was great. The WIP website is gone, but the forum remains. I'd actively contribute to a forum or here on your blog if that's the level of involvement you're looking for. Seriously, though, our intention is to start by just putting the material up and then see where it takes us. If it gets too noisy, then we'll port to another site. If we set up a forum, does anyone have a preference for or against Google Groups or Yahoo Groups? I don't have a preference for a discussion group. The Agile-Book web-site for the WIP book was there. Some of the structure still remains there (the contents page, mainly). Assuming you get enough participation to make it worthwhile then once you get enough material it will become hard to navigate and you might want to consider a similar structure. It'd also be nice to see where you're headed with your book. We've created a Yahoo Group for people to give feedback and discuss the content.